Announcement Wrap jewelry handmade with genuine leather and beads. High-quality bracelets, anklets, necklaces and more for effortless and versatile style. A great gift for birthdays, anniversaries, holidays, and bridesmaids! Head on over to http://www.wrappedtowear.com for the full collection, styling ideas, and all sorts of inspiration! 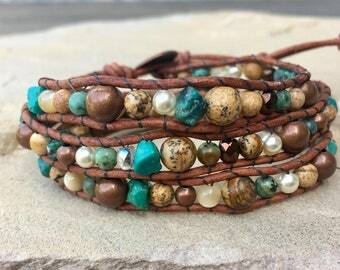 Wrap jewelry handmade with genuine leather and beads. 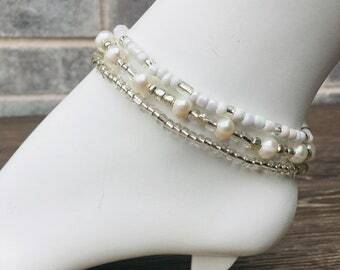 High-quality bracelets, anklets, necklaces and more for effortless and versatile style. 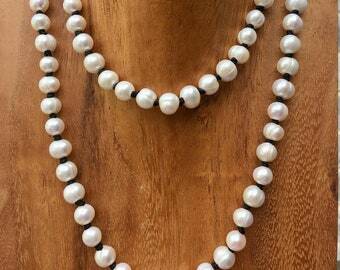 A great gift for birthdays, anniversaries, holidays, and bridesmaids! Great set of 3 bracelets. Well made with great clasps. Wear together or separately. 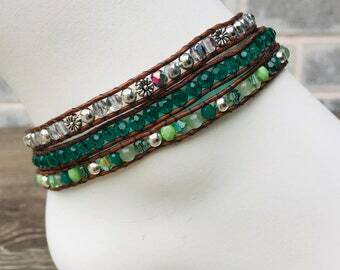 LOVE this wrap stack! So many ways to wear it and the colors are beautiful. Absolutely gorgeous! LOVE the blue and the fact that you can wear as a necklace or bracelet. 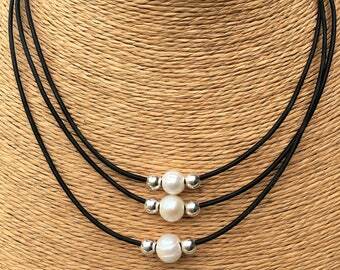 Wrapped to Wear never disappoints! Women helping Women - one bead at a time! Some of us bead because we want to - some of us bead because we need to. Many of us float back and forth between the two. Lesa started this shop in 2010 after she and her husband sold a commercial contracting business and decided to retire. No one thought Lesa would actual kick back and relax - but no one expected "Wrapped to Wear" to be born either! 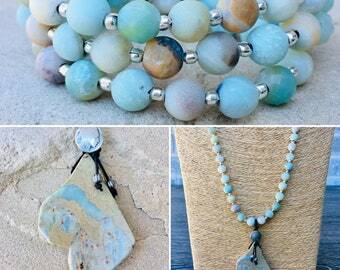 Out of a love for creativity, beauty, and jewelry Lesa started making Wraps. Their popularity bloomed and so did the business. Sister Mary Beth, niece Allie, and friend Kelly were the initial team. Over time, many including Lora and her daughter Jessica, have joined the fun. There is a group of 6 that should be considered "the shop" and have full time focus on the business. However, there are many other special ladies from the local community that are on the team and help make the products as the demand increase. This is the real beauty of the story. Wrapped to Wear was not born out of a business plan or marketing strategy. We believe the company is a vehicle, inspired by God, that has provided for many of our team member in a time of need. It has provided that extra opportunity for teachers, retirees, and family members to earn supplemental income to smooth out some of life's bumps. For others it has provided a sense of community or a creative outlet. Every bead is hand sewn by a loving heart from our North Austin community. As we said in the beginning - some of us bead because we want to and some of us bead because we need to. Either way, we bead a lot!! In 2016 we produced well over 5,000 products and are still growing. We are so very grateful to our customers for giving us this opportunity and for taking this whimsical journey with us! As a labor of love, Lesa started hand making wraps in February of 2010 and hasn't stopped since. She enjoys experimenting and creating different statements by blending colors, textures, and themes throughout her designs. Mary Beth works closely with Lesa as only sisters can. She specializes in piece production and quality control. Mary Beth keeps Lesa's designs grounded such that they will give the wearer many years of pleasure. They make quite the team. Lora also designs and produces wraps. She and her daughter Jessica focus on the Dallas/Ft. Worth market and have done an excellent job of designing and delivering to this demographic. They have many faithful fans. What are the measurements of your wraps? 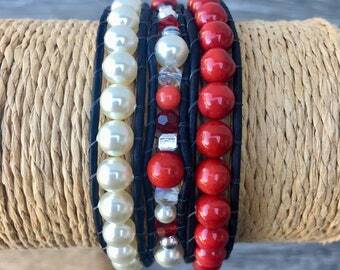 All bracelet wraps are 35" to 37" to accommodate most wrist sizes, and wrap the wrist 5 times. If you don't have a "most wrist size", special lengths are available upon request! The anklets are a single wrap that measures from 9.5" to 10.5 inches. These are similar in design featuring leather binding and the button and loop closure. All wraps have two or three button loop closures. After you have fit your wrap to your best fit, feel free to clip the extra loops off. Wearing your wrap is simple, use your fingers to capture the loop on your wrist - wrap the bracelet and insert the decorative button into the loop that feels best for your fit. How can I tell what color combos the bracelets come in? We will describe the product by first listing the Binding Color, then the Base Bead, and finally the accent bead. Please keep in mind that while we strive for accuracy in the photos, the colors pictured are not always representative of the product. What makes Wrapped To Wear special? Each Wrapped To Wear bracelet is handmade with precision, quality and detail, so you can enjoy our versatile jewelry for years to come. If you are for any reason unhappy with your purchase, simply contact us to receive your return authorization and send the merchandise back within 10 days for a full refund or store credit. Items must be returned in original packaging and in salable condition. Shipping costs are non-refundable, and the return shipping costs are the responsibility of the customer. If an order must be returned due to an error by Wrapped To Wear, e.g., incorrect items were shipped, please contact us for return-shipping instructions. For ALL returns, please include a copy of your receipt and your reason for returning the items. Ship your returns by insured UPS ground or certified USPS mail. Upon our receipt of the returned items, a refund or store credit for the full merchandise cost will be issued in the original form of payment. Promotional, custom and sale purchases are final and not returnable. The full Wrapped To Wear collection is available for purchase in our Etsy shop. Our Etsy store uses PayPal for payments, and PayPal automatically encrypts your confidential information in transit from your computer to ours using the Secure Sockets Layer protocol (SSL) with an encryption key length of 128-bits (the highest level commercially available). PayPal accepts all major credit cards, nd you may use your credit . You are not required to have a PayPal account to purchase from our store, but you will checkout via PayPal. PayPal acceps all major credit cards. If you already have a PayPal account, you may use it. Etsy automatically calculates tax for qualifying orders. Sales tax is applicable for orders shipped within Texas. Is there a quantity limit for orders? No, you may order however many you want! Since each bracelet is handmade, please email us for bulk quantities to ensure inventory availability. Larger orders may take longer to ship depending on stock. I own a boutique....can I open up a wholesale account? Yes, please send us an email using the contact form with some information about your store, contact info, and a website if applicable. Shipping and handling costs are calculated by Etsy and determined by the weight of the purchased items, the shipping method chosen and the destination. Most packages within the US will be shipped via USPS, and costs a flat rate of $5.00. Additional wraps on the same order will add $1.00 extra. Orders will be processed and shipped within 2–3 business days from when they are placed. Personalized orders will ship within 1–2 weeks. Shipping times are provided by the carrier and may vary by package destination and holiday seasons. Tracking numbers are available upon request. Please contact us to request signature confirmation to Priority Mail shipments. Once an order is shipped, the package then becomes that carrier's responsibility and Wrapped To Wear is no longer liable. Yes, please contact us directly to place an international order. Yes. All full size wraps ship in a hand stamped jute gift bag, and can be gift wrapped for no extra charge. Please specify that you would like your order gift wrapped in the comments section of your Etsy order, and contact us after your Etsy purchase is made to ensure that the request was recieved. At this time, we are not offering gift cards. However, a custom wrap would be a great gift that the receiver is sure to love! Yes! We are always happy to help make suggestions, design a custom wrap, or answer any questions you may have.